For those of you that follow my social media channels, you’ll no doubt see I’ve been rather busy. My first couple of pop up restaurants have gone well. 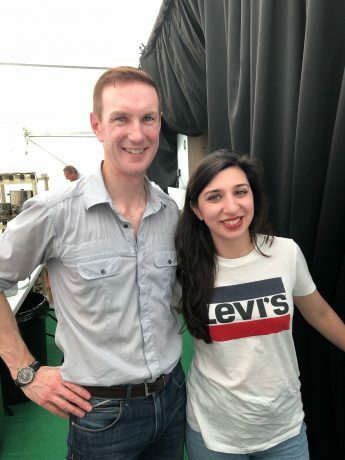 I then also did my first food demonstration at Foodies Festival this weekend in London. 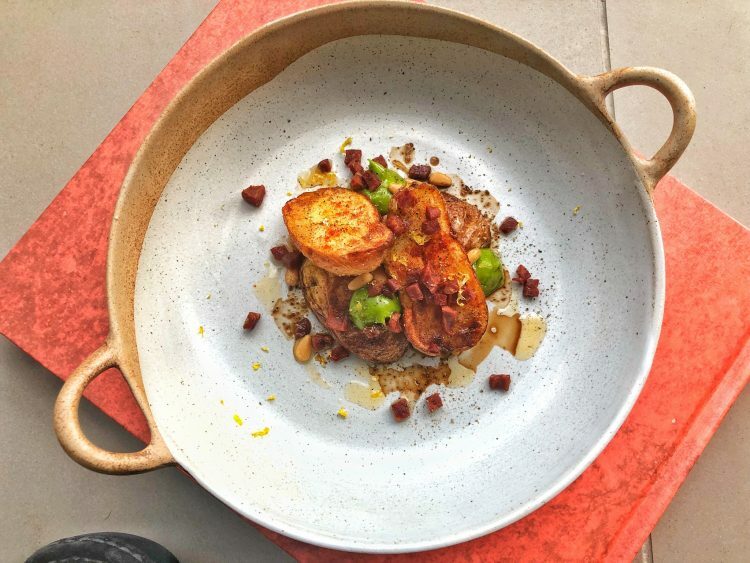 Chorizo roasted potatoes, parsley aioli and smoked almonds. 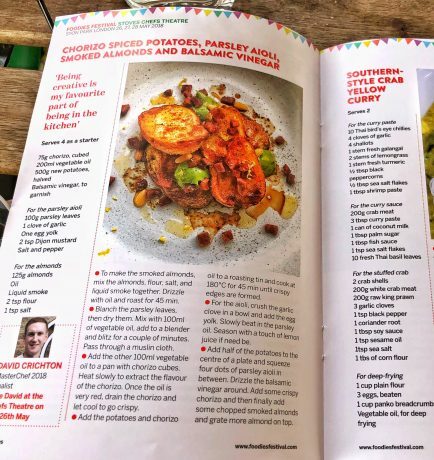 I was flicking through the festival magazine admiring the great chefs recipes and stumbled across my own. How cool. I’d completely forgotten they’d asked for it. The demo went really well apart from burning my hand on a saucepan, guess that’s par for the course being a cook. I met some very famous chefs from London and previous MasterChef champions Dhruv Baker and Saliha Mahmood Ahmed. Dhruv was comparing and made my demo very easy, filling in where need be. It was then straight home and off to Cancun early the next morning. My life is generally taking this pattern at the moment. I return from Mexico, prep for my next pop-up, plus a dinner invite! Fly to Orlando, back, private dining, fly……….I’ll certainly only be doing this once. Life is very tiring, but incredibly fulfilling and exciting. Who knows what I might be up to next month. Keep an eye out on my Events tab at the top. That’s my main source with links of what and where I’ll be cooking. David, brilliant to read how everything in the culinary world is literally ‘taking off’! Dave and I are booked in for the six course taster at The Rivals, can’t wait. Will definitely be over to see your demonstration at the Foodie Festival, Tatton Park. I’m in The Housekeeper’s Store, we have a wide range of venison, pork and lamb from the Estate and also game. Check us out if time permits. Appreciate your celebrity status now and that time is very precious though! Oh excellent Yvonne. Thanks for the support. I’ll definitely come into the shop. If I had anytime left I’d come down before the festival! Congratulations Dave, JT and I are very happy for you. How very exciting for you…congratulations.